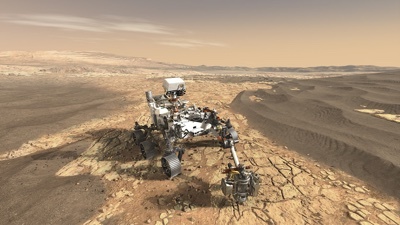 This illustration depicts NASA's Mars 2020 rover on the surface of Mars. The mission, targeted for launch in July/August 2020, takes the next step by not only seeking signs of habitable conditions on Mars in the ancient past, but also searching for signs of past microbial life itself. NASA is preparing for the next mission to Mars timed for a launch in 2020. Finnish Meteorological Institute (FMI) is among the partners providing measurement equipment for the new Mars 2020 Rover. The pressure and humidity measurement devices are based on Vaisala's sensor technology and are similar to the ones already delivered to Mars on the first Curiosity Rover. In addition, Mars 2020 Rover will carry Vaisala's newer and more advanced pressure and humidity sensor heads. The Mars 2020 mission is part of NASA's Mars Exploration Programme and it aims to gather more knowledge on Martian atmosphere and other environmental conditions. The Mars 2020 Rover will be equipped with Vaisala BAROCAP and HUMICAP pressure and humidity sensors. The sensors are part of instrumentation designed by the Finnish Meteorological Institute (FMI), and they will be used to gather accurate readings of pressure and humidity in the extreme environmental conditions of the Martian atmosphere. The new mission equipment will complement the already existing measurement tools on Mars taken there by Curiosity in 2012. While working on Mars, Curiosity and Mars 2020 Rover will create a small-scale observation network which anticipates the extensive MetNet Observation Network planned on Mars for the future. "We are very happy and proud that Vaisala's equipment has again been selected as an affiliate for space exploration that will help us understand the world around us. Accurate and reliable measurements are in the core of this understanding. Vaisala's strength is exactly that: Our sensors function reliably and accurately also in the extreme conditions on Mars", says Liisa Åström, Vice President, Products and Systems of Vaisala. Vaisala has a long history of providing sensors for space explorations, dating all the way back to the 1950s, when Vaisala converted the frequency of a radio theodolite to help track Sputnik I, the world's first artificial satellite. Since then, Vaisala has been involved in a number of fascinating missions, providing technology to help understand the universe. Since 1992, Vaisala's carbon dioxide, humidity, and temperature sensors have been used to control life science experiments both onboard space shuttle flights and at the International Space Station. Vaisala's pressure sensors were also part of NASA's Cassini mission which was launched in 1997, and in 2005 achieved the first ever landing on a moon in the outer solar system: Titan, the largest moon of Saturn. This is one of the most ambitious missions ever launched into space and is still ongoing. Vaisala's technology is utilised in space exploration due to their extreme stability, which is vital due to the extreme environmental conditions in space. Vaisala's sensors are able to withstand extreme heat and cold and are highly tolerant of shaking and vibration of the space travel. 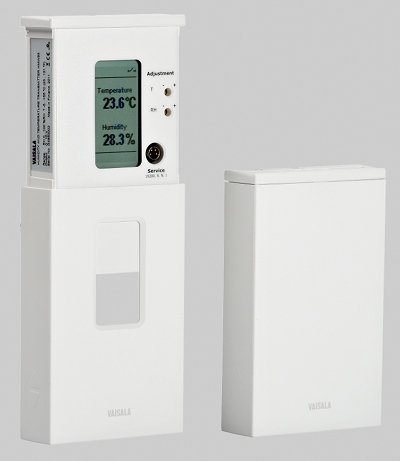 Vaisala HUMICAP and BAROCAP sensor technologies are used in numerous Vaisala products, such as radiosondes, weather stations and various industrial applications. Thanks to the long-term stability and accuracy of these sensors, as well as their ability to tolerate dust, chemicals, and harsh environmental conditions, the technologies are suitable for very demanding applications. Over the years, Vaisala has always had strong focus on product development. Majority of Vaisala's product development is located in Finland, as is the sensor factory with its crown jewel, the cleanroom. "Vaisala is constantly in the eye of the technological innovation and development. We invest a lot in the product development and also in basic scientific research, which is not very common in the business. The continuous development, in-house expertise, the keen interest in science and technological know-how keeps us on the top of the game", says Åström.